Compliance and information security have had a tumultuous relationship. Sometimes they get along; sometimes they don't. Organizations often combine them under the CISO, but provide dotted line reporting elsewhere for compliance. Compliance might partner with internal audit or have its own C-level position. All of this variation isn't really necessary. Compliance and Risk Management can be successfully combined under the practice of Security Performance Management. •Compliance behaves like more traditional information security threat. •Compliance can be managed similarly to other information security programs. •Security Performance Management provides a framework for comprehensive compliance and risk management across the enterprise. Everyday information security professionals are bombarded with marketing messages around risk and threat management, fostering an environment in which objectives seem clear: manage risk, manage threat, stop attacks, identify attackers. These objectives aren't wrong, but they are fundamentally misleading. In this session we'll examine the state of the information security industry in order to understand how the current climate fails to address the true needs of the business. We'll use those lessons as a foundation for developing a business focused information security organization, built around real objectives and metrics. Over the last year the threat environment has changed dramatically to include three distinct categories of attackers, and all three types of attackers are targeting organizations of every size and their data. This presentation will discuss the differences in motivation and intent for the three different types of attackers and discuss how security teams can use OODA loop principals to create and refine practical cyber security defenses for all three threat categories. Vulnerability management needs a new approach. The traditional concept of scan and remediate simply doesn't work. Why do we persist in pursuing failed strategies? Stop spending time in an endless loop of scanning and fixing, instead figure out what you want to accomplish, set up your goals and then pursue them relentlessly. This is Security Performance Management. 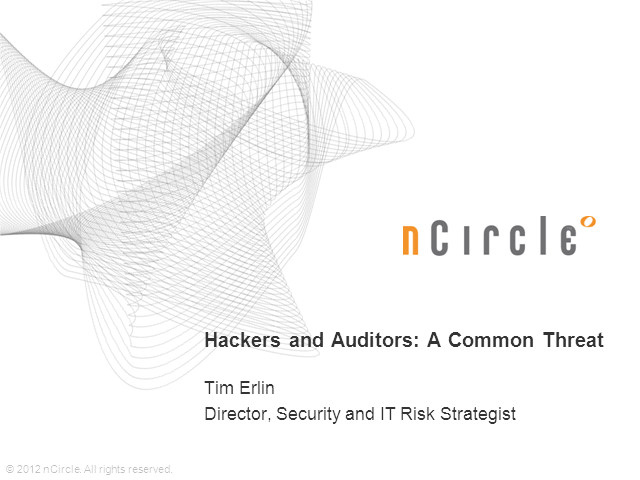 You’ll leave the webinar with an online questionnaire that will help you build a blueprint of prospective vendors’ security practices, and practical recommendations on how to accurately assess cloud vendor security risk.